Learn about kindness at one of our workshops. A civil and respectful workplace can make a difference and create a positive work environment. Learn how to create this atmosphere in your workplace. Organizational culture can set the stage for improved work relations and harmony. Learn practical tips and resources to address it in your workplace. Consider the impact of kindness and how you can help it flourish in your workplace in order to improve engagement and productivity, and reduce stress and absentism. This part will be lead by Kind Canada Généreux. Ottawa Public Health has created a series of workshops to help workplaces move along their journey to implementation of the National Standard for Psychological Health and Safety in the Workplace. Each workshop will take a closer look at two of the 13 factors that are the building blocks for a mentally healthy and safe workplace. Participants can go to all of the workshops or can attend only those that address the factors of most interest to them and their workplace. Workshop is offered in English only. Resources will be available in English and French. 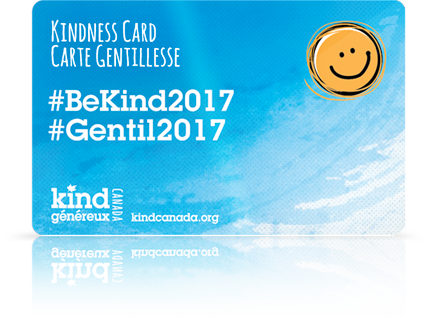 Become a Kindness Card partner and celebrate Canada's 150th. To the Health and well-being of Canadians. Download your copy of our case for support. Be Kind. Make a Difference. 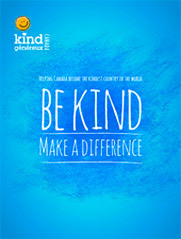 Kind Canada Généreux inspires and engages all Canadians to purposefully include kindness in their daily lives, support charitable causes and enhance the well-being of others. Subscribe to receive email updates from Kind Canada. We promise not to send too many emails! Please put some kindness in my inbox! Add me to the Kind Canada mailing list. Copyright © 2016 Kind Canada Généreux. All Rights Reserved.